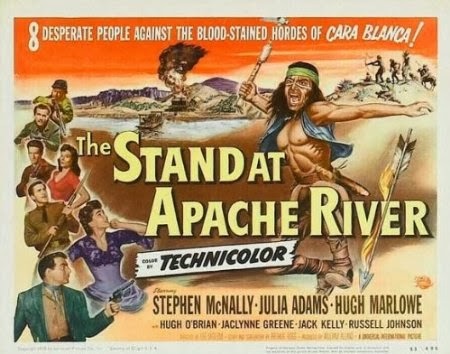 Colin's most recent post at Riding the High Country was on Universal's THE STAND AT APACHE RIVER (1953). That post combined with my love for Universal's '50s Westerns prompted me to dig out my recording of the movie from Encore Westerns Channel, and I enjoyed it very much. Lane Dakota (Stephen McNally) is a lawman intent on chasing down Greiner (Russell Johnson), a murderer, and bringing him in for trial. Dakota catches Greiner, who's been wounded by Apaches, and he takes him to the Apache River stage and ferry station, intending to stay until Greiner can travel. 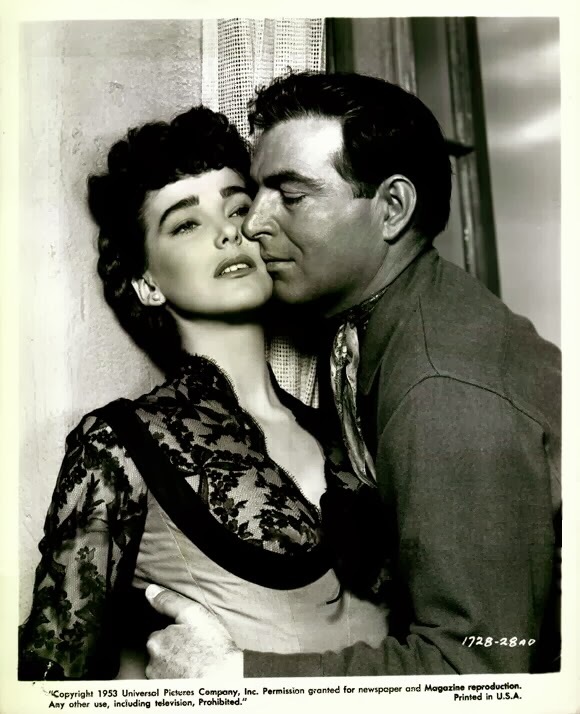 Simultaneously arriving at the station are Valerie (Julie Adams, billed Julia here), who's come west to marry a fiance she hasn't seen in a year, and Col. Morsby (Hugh Marlowe), a martinet who hates Indians. Naturally, just as all these folks converge on the station, it comes under siege from the Apaches, who are hungry and have left their reservation. Dakota and Morsby clash as they have conflicting ideas on dealing with the crisis. 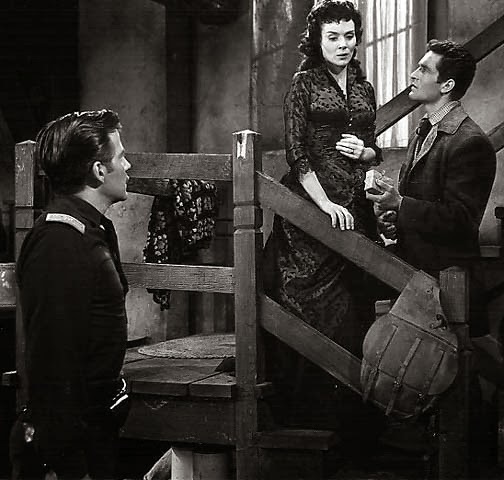 There's also the station owner (Hugh O'Brian) who's been on a trip and must make his way home through the warring Indians; while he's away his lonely, bitterly unhappy wife Ann (Jaclynne Greene) has been casting longing eyes at her husband's assistant, the handsome, thoughtful Hatcher (Jack Kelly). I agree with Colin that the movie tries to do a lot in a short 77-minute running time, which results in some storylines receiving short shrift; there are several interesting plot threads and not enough time to tell them all. On the other hand, one of the things I appreciate about a Universal Western is the brisk pacing, and if nothing else this film certainly moves fast! The movie should have been about 15 minutes longer, but what's there is a good film. The movie is a typically appealing Universal production with an attractive cast, solid production values, and nice color photography. For years I mostly knew Stephen McNally from his earlier career days in smaller roles at MGM, where he was billed as Horace McNally. I've really enjoyed getting to know his work from his "Stephen" era in films such as the classic film noir CRISS CROSS (1949) and a very good Universal Western, APACHE DRUMS (1951); he's also in the cast of WINCHESTER '73 (1950), which I hope to see at UCLA next month. He's fine as the determined sheriff whose behavior is initially questioned by Valerie but who proves to be an ethical and capable leader when the chips are down. Adams' Valerie is dressed in almost unbelievable finery for a long stagecoach journey west, but she quickly proves her mettle, tending to the injured and keeping the men fed as they keep watch, while Ann is too caught up in her own drama to care. Towards the end Adams also gets to demonstrate the screaming abilities she would show off again the next year in the sci-fi classic CREATURE FROM THE BLACK LAGOON (1954). Again, the only drawback is that Lane and Valerie's story is resolved way too quickly, with Valerie writing off her fiance with "He'll understand." One aspect where I part company with Colin is on Jaclynne Greene's performance as Ann. Greene is such a sour, sharp-tongued harpy that it was hard for me to understand why she would have not one but two men pining for her affections. Why would anyone want to spend time around such an unpleasant woman? Part of the issue is simply the part itself, but Greene's one-note performance grew tedious for me; her constant anger outweighs any sympathy which might have been engendered by the woman's plight. A burial plot visible in the background is an unspoken testament to her hard life. On the other hand, my favorite MAVERICK brother, Jack Kelly, manages to convey quite a bit about his character despite an underwritten role. For instance, though there's no dialogue about his feelings for Ann until late in the film, when there's danger or controversy, he always looks over to Ann or goes to stand beside her. Why he loves her, on the other hand, remains a mystery! And he seems to be such a competent and reliable man that his final scenes in the film stretch credulity. 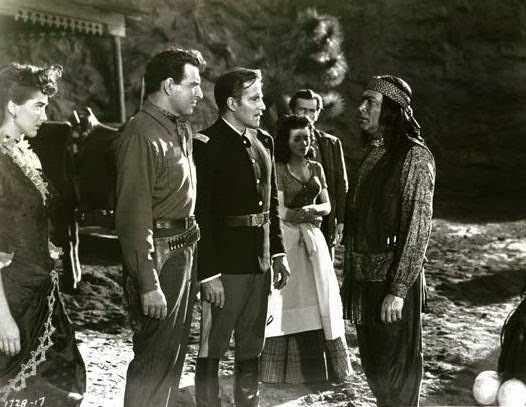 The movie presents a relatively balanced portrait of Indians, with their leader Cara Blanca (Edgar Barrier) proving to be more sympathetic than the inflexible Morsby. Forrest Lewis rounds out the cast as the stagecoach driver holed up with everyone else. THE STAND AT APACHE RIVER was directed by Lee Sholem. 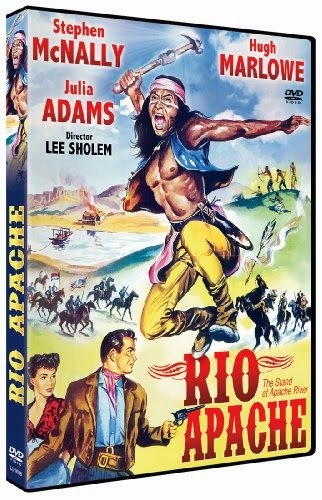 The Arthur A. Ross screenplay was based on the novel APACHE LANDING by Robert Hogan. The film was shot in Technicolor by Charles P. Boyle; some of the movie was shot at California's Red Rock Canyon. Like far too many Universal Westerns, THE STAND AT APACHE RIVER has not had a U.S. release on either VHS or DVD. It's been released on a Region 2 DVD in Spain. THE STAND AT APACHE RIVER is shown from time to time on the Encore Westerns Channel. 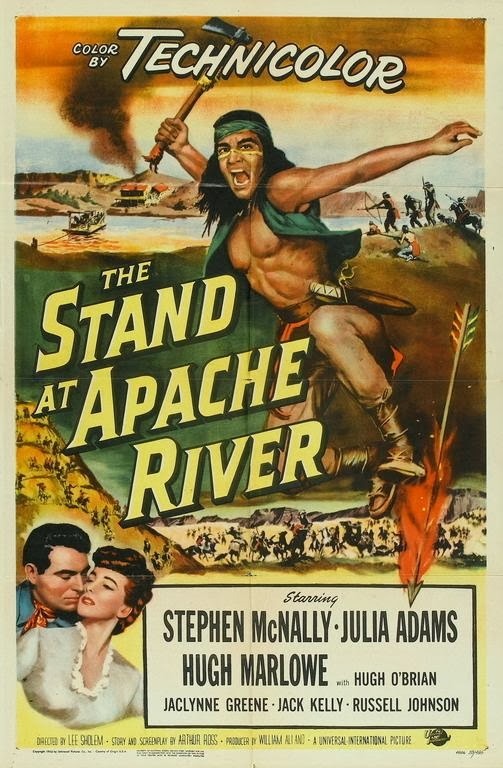 Despite its imperfections, THE STAND AT APACHE RIVER provides enjoyable Western entertainment. If only there had been more of a good thing! Firstly, thanks for the mention and link Laura. It's good you had the opportunity to see and enjoy this. On Jaclynne Greene's role, I see your point about her appearing unattractive but I put the character flaws down to her being isolated in a hostile environment and, crucially, finding herself trapped in a loveless marriage. The packed plot does rather diminish this but the scenes where Greene and Adams get to have a few chats reveals quite a lot in terms of her character's motivations and feelings - or so I thought anyway. You're welcome, Colin, and thanks for elaborating on your thoughts on Jaclynne Greene! I just had trouble seeing her as ever being nice given how rude she was to people who had no part in her problems. I did find the interactions you mention with Julie Adams' character interesting.